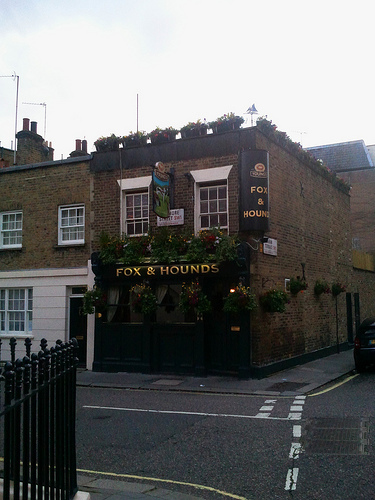 A decent little pub in an area where rents and the price of property have all but killed decent little pubs, the Fox and Hounds in Belgravia was built in the 1860s, supposedly - we are told - to serve working people that lived in the cottages nearby. Today, it is at the heart of one of London's richest areas, but is still a great little community pub, serving decent Young's ales. When your author popped in recently, it was very relaxed, and the brewery website informs us that it prides itself on having no TVs and no music, which was certainly very welcome. Over at fancyapint they also tell us that it was, until 1998, the last 'beer only' pub in London, serving nothing but beer to loyal customers. Apart from good beer and good conversation, you have to love the Victorian pub architecture and decoration. If only the second side of the pub looked like the front. Plain bricks look ugly.